1 Ms. Brush was happy that Gustav, the museum's expert on art restoration, had uncovered an important clue in the corner of Aunt Rayna's painting. The art historian ran as fast as her legs could carry her to the abstract art room in the museum. There, Aunt Rayna and her great-nephew and great-niece stood waiting for her to return. They were still staring at Jackson Pollock's abstract art. 2 "We have a clue!" puffed Ms. Brush. She sat down on a wooden bench, her body quivering with excitement. 3 "What is it?" cried Shelly and Brian together. They were starting to appreciate their visit with Aunt Rayna while their parents were away. Things were getting better every minute! They sat down next to Ms. Brush and peered eagerly into her flushed face. Shelly realized that the woman's face matched her robin-red-breast shirt. 4 "Gustav made a discovery!" panted Ms. Brush. "The first letter of the artist's first name is a C!" 5 "Is that all?" cried the children. They knew nothing about famous artists. 6 "C?" whispered Aunt Rayna. She knew a little about famous artists. 7 They all sat down on the bench. Ms. Brush, who knew a lot about famous artists, nodded at Aunt Rayna, whose thin, pale lips curled into a wide grin. Her eyes brightened and she tucked a wisp of gray hair behind her pink ear. 8 "Well, let's keep going!" said Ms. Brush. "The next room of the museum has other abstract art in it, but you will find it quite unusual!" 9 Ms. Brush entered the next room with a flourish. One set of walls was sky blue. The opposite set of walls was fire-engine red. On the walls were paintings with many strange shapes on them. Brian read the description of one painting. "Picasso! Wow! " he said. "Look at where those eyes are in that painting!" 10 "This room is full of his art done in the style called cubism. 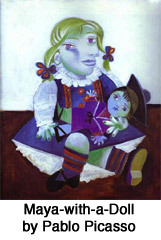 Cubists used many geometric shapes in their artwork. Picasso was a brilliant artist who had the ability to paint in many styles during his lifetime. Before he painted in this style, he had one period where he only painted things in blue. That is why these two walls are blue," said Ms. Brush as she pointed to two walls.